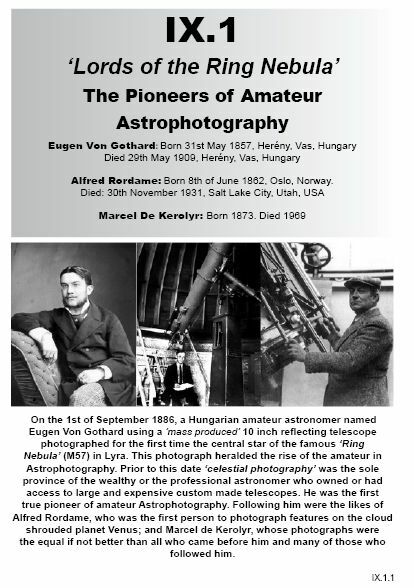 On the 1st of September 1886, a Hungarian amateur astronomer named Eugen Von Gothard using a ‘mass produced’ 10 inch reflecting telescope photographed for the first time the central star of the famous ‘Ring Nebula (M57) in Lyra. 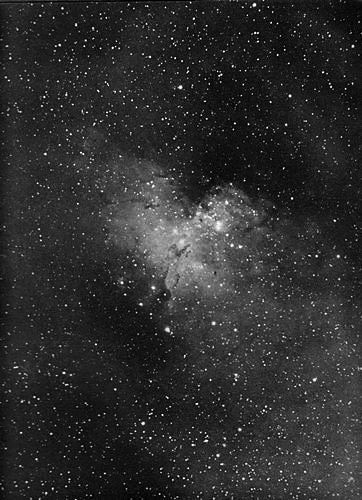 This photograph heralded the rise of the amateur in Astrophotography. 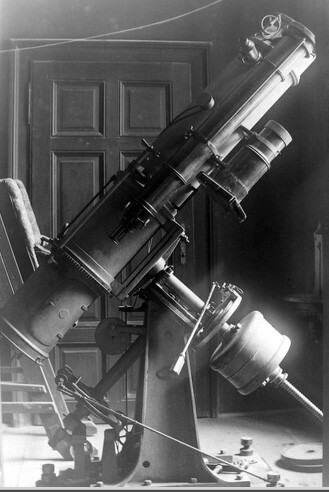 Prior to this date ‘celestial photography’ was the sole province of the wealthy or the professional astronomer who owned or had access to large and expensive custom made telescopes. 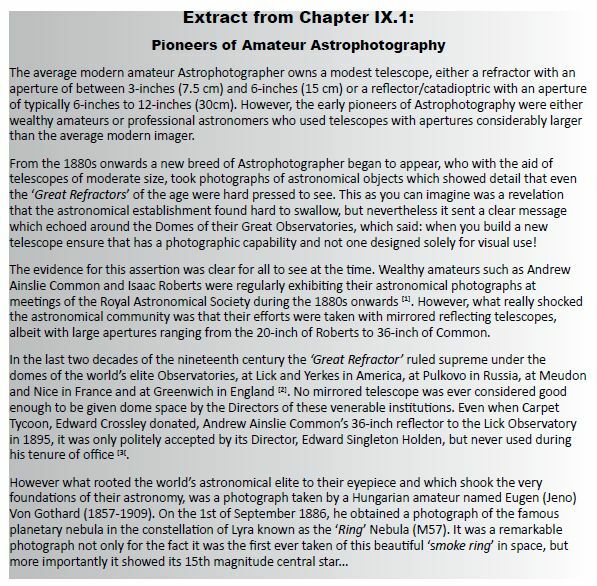 He was the first true pioneer of amateur Astrophotography. Following him were the violinists Alfred Rordame and Marcel De Kerolyr. 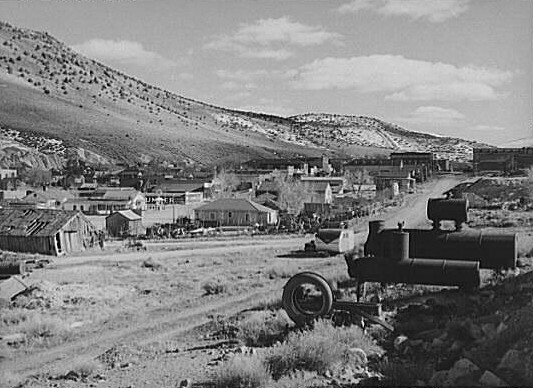 Rordame, was the first person to photograph features on the cloud shrouded planet Venus, but who had spent his early career as a musician in a Nevada brothel. Marcel de Kerolyr's photographs were the equal if not better than all who came before him and many of those who followed him. He too followed a career as a violinist accompanying his wife who was by all accounts a very talented singer. 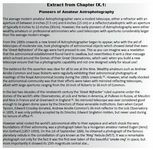 The author would like to thank: Alfred Rordame III and his son Alfred Rordame IV; I. J. Vincze, I. Jankovics, & J. Kovacs; Ancestry.com; Astronomische Nachrichten; Archives of the Gothard Astrophysical Observatory of Eötvös University; FamilySearch.org, the Observatoire de Haute-Provence; the Mount Wilson Observatory, the Paris Observatory, the Royal Astronomical Society of London; westernmininghistory.com for the use of the following items: text extracts from original sources, genealogical information, photographs, maps, drawings and illustrations included in this eBook.